Charlotte's Web showcases a selection of artworks from the Margaret Whitford Bequest. This collection of 46 artworks was bequeathed to Falmouth Art Gallery through the Art Fund in 2012. 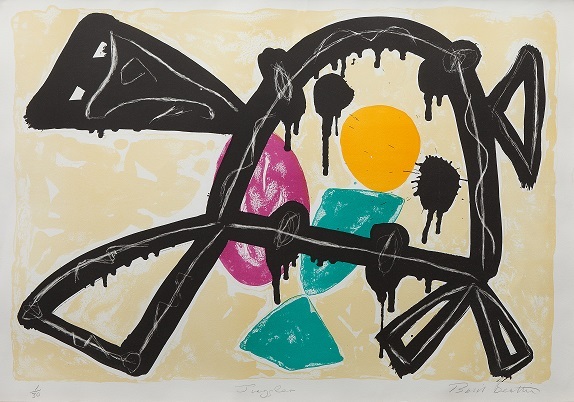 This series of abstract prints demonstrates how artists use a variety of genres to explore geometry, pattern, figurative and still life and includes work by well-known artists from around the globe including Basil Beattie RA, Sir Terry Frost RA, Grace Gardner, Kristian Krokfors and Rachel Whiteread CBE. This abstract theme reacquaints us with theories of colour, composition and Modernism which will be revisited several times in this year's exhibition programme for 2014, including Brilliant colour (20 September - 22 November) and Porthmeor past and present (29 November 2014 - 31 January 2015).